The working platform is processed by cellular positioning hole with high-quality aluminum and it's pedestal is welded by thick steel plate with steadiness and durability. 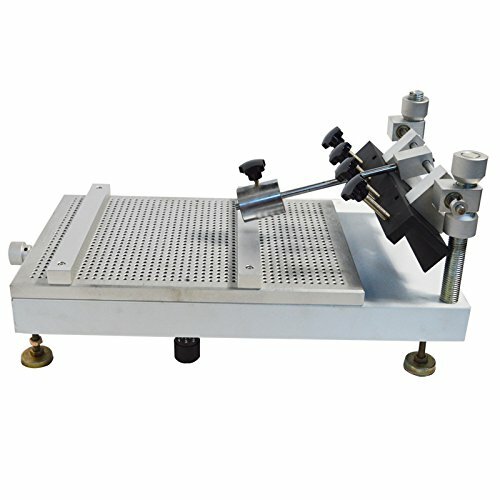 Circuit board adopts positioning needle, fixed rod and fixed plate for positioning, which can ensure convenient positioning and accuracy of repeated operation. Makeready mode is made through stencil's movement and combined with fine adjustment and correction of X, Y axis in printing platform, which is convenient and quick. Stencil stent uses spiral bearing and height can be adjusted up and down, which is convenient to control PCB's thickness and volume or printing cream. Printing plates are fixed by four rotary knobs whit platen and it is quick and strong.